As previously mentioned, there really isn’t anything better than getting your hands on new data. That new data smell, the excitement of telling someone that the singular of data is datum. I was really excited to see a follow up study (O’Connell, Hart & Boddy, 2016) to the Bauerfeind study that examined the influence of pitch velocity on arm stress (O’Connell & Boddy, 2016). After reading the article, there were some really surprising findings that I wanted to look into further. More specifically – the claim this study replicated the findings of Post et al (2015), and found a non-significant relationship between elbow valgus torque, and ball velocity. But, here are some of the key findings. – Vincent & Weir, 2012, page 117. The values reported in their text are r values, but I have adjusted them to be r2 values. The values reported by Post et al (2015) were an r2 of 0.04, and p=0.053, or, 4% of elbow valgus torque could be explained by ball velocity, and this relationship was not statistically significant. This is where I have some concerns with the interpretations of the newest study from O’Connell and Boddy (2016). 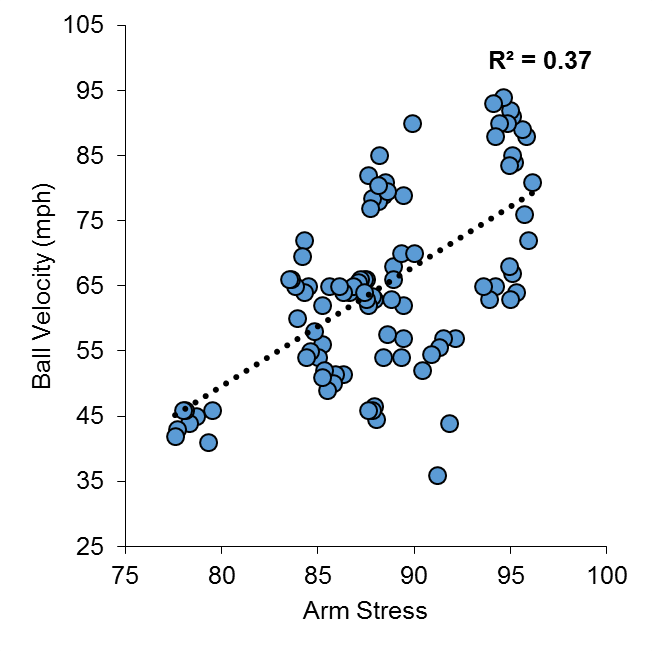 Their study reveals a statistically significant relationship between ball velocity and arm stress, in the low range of correlational strength (r2 = 0.21). Interpreting these results in their current form, these findings indicate that 21% of arm stress can be predicted using ball velocity alone. So, ignoring any differences in mechanics between pitchers, fatigued state, or pitcher body size, we already have a model that predicts 21% of our dependent variable. As someone who has spent a good amount of time wrestling with data, attempting to prove hypotheses about muscle fatigue, I would typically kill for a relationship with this strength! The findings of the O’Connell & Boddy study do not replicate those of Post et al., 2015 – they illustrate a link between arm stress and pitch velocity – and that is without moving on to some methodological concerns. The beauty of blogging, and posting open source data to try and further science, is that you live in a state of constant, dynamic, peer review. In many ways, this is vastly superior to the traditional publication model, where studies are reviewed by academics, then go to sit on bookshelves and are never looked at again. When open data is published, it gives others a chance to chime in on the results. Looking at the data that went in to calculating the r2 value of 0.21 between stress and velocity, a couple of things emerge. First of all, not all pitchers have the same contribution to the means. Two pitchers only threw 6 pitches, while one threw 19 pitches. If pitch velocity only indicates 21% of the variance in arm stress, there are clearly other factors at play. 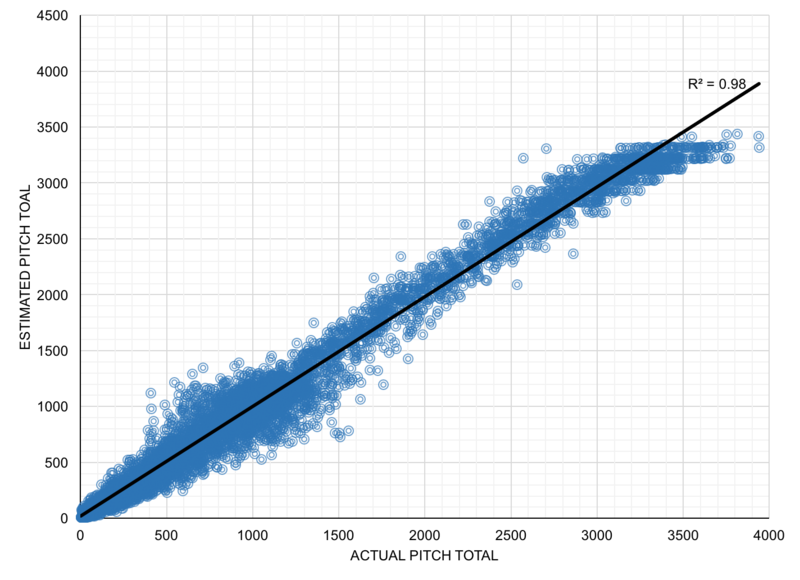 If we have an unequal number of pitches between our participants, we’re leaving room for error, by having someone with greater stress contributions from other variables swaying our correlation, one way, or the other. To try and accommodate for this, I removed the two pitchers from the analysis who only threw 6 pitches. I then took the average velocity, and stress, from the top 9 velocity throws from all other pitchers, and put them into the correlation with an n=15. The correlation between velocity and stress now goes up to r2 = 0.32, or 32% of the variance in arm stress is accounted for by ball speed. Including all of the pitches individually, and only using the top 9 pitches from each pitcher (an n=97), we end up with a correlation of r2 = 0.37 between velocity and arm stress. When your model can account for 37% of the variance between one variable and another, you are definitely on to something. This is statistically significant, and when visualized (Figure 1), it becomes quite clear that a relationship exists. In fact, this number appears to be nearly an exact replica of another study, where Hurd et al., (2012), found a relationship of r2 = 0.37 between pitch velocity and elbow adduction moment. So, what about the other variables that the Motus sleeve spits out? I can’t tell you with 100% certainty what arm slot, or shoulder rotation means from these data, but I included ball speed, arm speed, arm slot, and shoulder rotation, in a multiple linear regression model to predict Stress. Once again, I used the top 9 velocity pitches from 15 pitchers to do this analysis. To put all of the variables on the same scale, I converted them all into z-scores – this will give us standardized coefficients that we can compare against one another in our regression output. In summary, this model produced an r2 value of 0.55, with Arm Slot and Shoulder Rotation not being the weakest predictors of arm stress, and arm speed having a negative relationship with arm stress (Figure 2). Figure 2. Predicted and actual UCL stress (z scores), from input variables of ball velocity, arm slot, arm speed, and shoulder rotation. It is quite clear that there are other variables not being measured that will help produce a better model of arm stress, but from the main predictor of arm stress right now remains ball velocity. These data collected using the Motus Sleeve, on one of the more advanced populations of pitchers that have been researched, echoes many of the findings that Hurd et al., (2012) produced in a lab setting. It is important to understand how statistics are interpreted, and what assumptions go in to calculating results. This study goes deeper into understanding the stress on the arm during pitching (as this is tracked from actual bullpen sessions, and not flat ground throws like in the Bauerfeind study). Other studies that have examined the risk of UCL injury in youth pitchers, have identified fatigue, stature, and cumulative pitch effects as risk factors for injury (Chalmers et al., 2015). In summary, pitch velocity shows a significant relationship with arm stress, using the Motus Sleeve. If you throw harder, chances are, you will have higher levels of stress on your UCL. It is important to properly condition and be strong, so you can withstand these stresses. 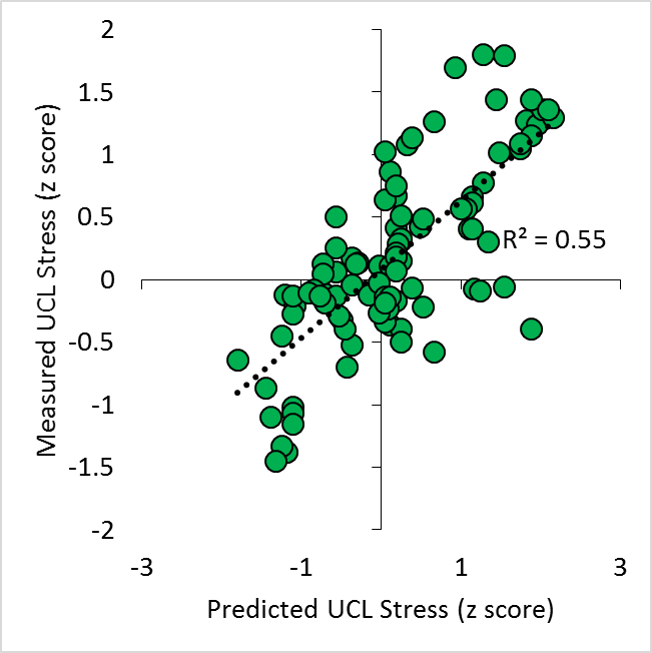 There are many other factors that go in to determining just how much stress is on the UCL, but these must be further studied by hard working groups like Driveline, and researchers in other facilities. Here are the data I used for the analyses above. Chalmers, P. N., Sgroi, T., Riff, A. J., Lesniak, M., Sayegh, E. T., Verma, N. N., … & Romeo, A. A. (2015). Correlates with history of injury in youth and adolescent pitchers. Arthroscopy: The Journal of Arthroscopic & Related Surgery, 31(7), 1349-1357. Hurd, W. J., Jazayeri, R., Mohr, K., Limpisvasti, O., ElAttrache, N. S., & Kaufman, K. R. (2012). Pitch velocity is a predictor of medial elbow distraction forces in the uninjured high school–aged baseball pitcher. Sports Health: A Multidisciplinary Approach, 4(5), 415-418. O’Connell, M., Hart, S., & Boddy, K. (2016). Elbow Stress, Motus Sleeve, and Velocity. Retrieved from https://www.drivelinebaseball.com/elbow-stress-motus-sleeve-velocity/, November 4, 2016. O’Connell, M., & Boddy, K. (2016). Can You Reduce Pitching Elbow Stress Using a Sleeve? Retrieved from https://www.drivelinebaseball.com/can-reduce-pitching-elbow-stress-using-sleeve/, November 4, 2016. Post, E. G., Laudner, K. G., McLoda, T. A., Wong, R., & Meister, K. (2015). Correlation of shoulder and elbow kinetics with ball velocity in collegiate baseball pitchers. Journal of athletic training, 50(6), 629-633. Sonne, M.W. (2016). UCL Stress and Velocity Increases. Retrieved from http://www.mikesonne.ca/baseball/ucl-stress-and-velocity-increases/, on November 4, 2016. Vincent, W., & Weir, J. (1999). Statistics in kinesiology. Human Kinetics. Champagne, Illinois. 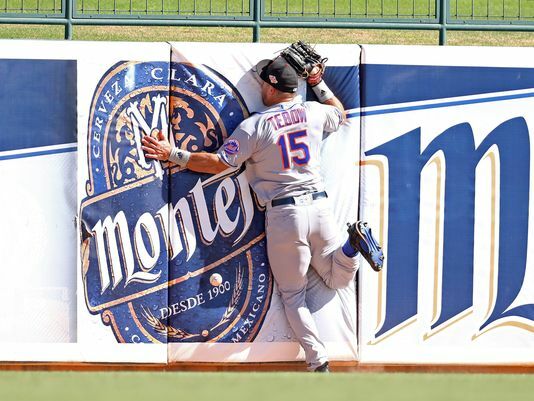 Believe it or not, the Arizona Fall League is a place where players other than Tim Tebow go, to refine their skills before making it to the bigs. When they aren’t faith healing fans who have fallen ill, AFL pitchers are throwing a repertoire of pitches that they hope will propel them to the next levels of their minor league careers. Luckily for us, MLB has put out the pitchf/x data from the past 2 seasons (with the 2016 data coming). This allows me to calculate pitcher’s Stuff from the AFL. The Stuff metric has been closely related to a lot of performance metrics at the MLB level – but I have not had a chance to look at any minor league data, until this point. I wanted to see how Stuff in the AFL compared to MLB Stuff – and to see if this has any potential as a scouting metric in parks that have PitchF/X. Let’s compare. I used the calculated Stuff metric from the 2016 as my MLB standard. The stuff list is the same one found on www.mikesonne.ca. I downloaded the PitchF/X outputs from Baseball Savant (for the 2014, and 2015 AFL seasons), and calculated Stuff in the same way mentioned here. To try and get some sort of consistency, I only calculated stuff for pitchers that threw 30 pitches in the AFL. Additionally, pitchers had to have thrown at least 10 innings in the MLB in 2016. For analysis, I compared the 2016 Stuff against the AFL stuff using a Pearson’s correlation coefficient. First off, from the 116 different pitchers that had PitchF/X data in the AFL, only 23 managed to fit both inclusion criteria. The average fastball velocity, offspeed velocity, change of speed, and break distances, as well as correlation coefficients can be found in table 1. Table 1. Summary of variables from AFL and MLB. 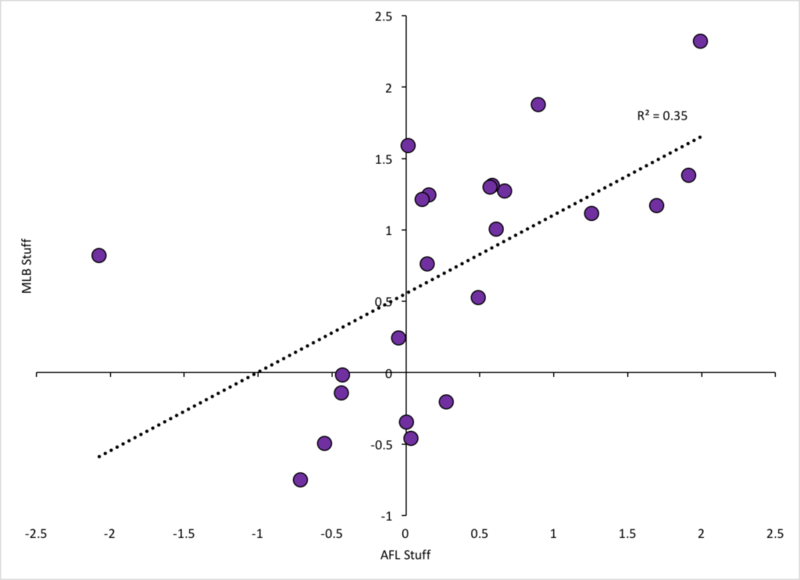 All components of the Stuff metric correlated well between AFL and MLB measures. Velocity had the strongest relationship (r = 0.85) between the measures at the AFL and MLB. Movement had the weakest relationship (r = 0.33). Overall, AFL stuff accounted for 35% of the variance in MLB stuff. Not great, but definitely a good start. This is really a small sample size, and if we omit the data from one outling pitcher (Adam Morgan), the r value goes up to 0.77. The PitchF/X system can be a bit finicky, so there’s a chance that some of the movement data discrepancies are a factor of the different parks in the AFL. Maybe these cameras weren’t as sensitive to the pitch movement, or maybe, the pitchers at this time in their development, weren’t as good at generating movement. In summary – there is a decent relationship between AFL and MLB Stuff – it isn’t perfect, but this could be used as a possible way to track pitcher development, and another tool for evaluating Stuff prior to arriving in the MLB. Right now, there aren’t enough pitchers from the AFL who have made their way to the MLB to truly get an idea of how their Stuff develops – but this is an encouraging start. 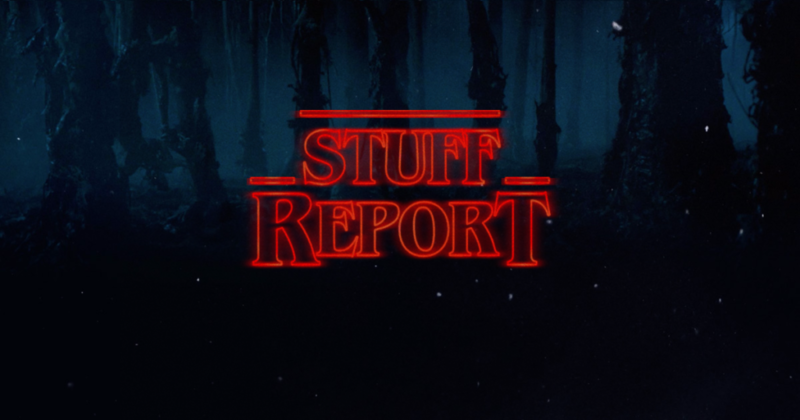 Ladies and gentlemen, put on your finest tuxedo, and get “Golden Globe” drunk – it’s time for the culmination of a year’s worth of Stuff reports – The Stuffies! While the Stuffies currently have less cache than some of baseball’s more talked about awards – like the MVP, there’s no room for philosophizing about what “valuable” means. Like a Mark Shapiro-led front office, these awards are data driven. 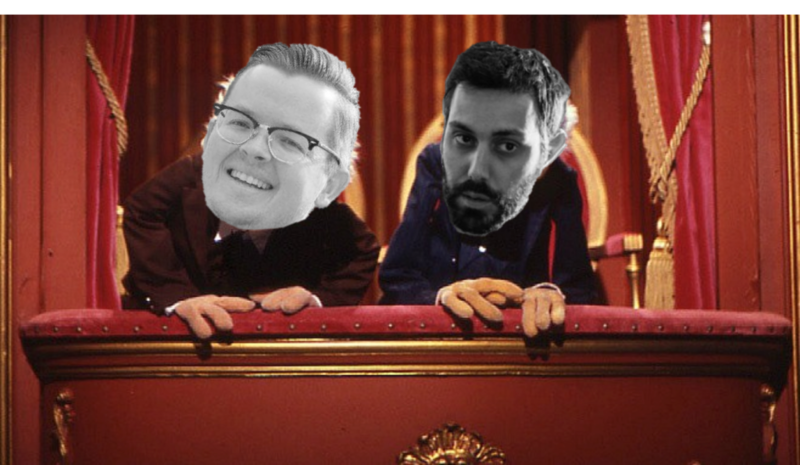 Here are the BBSWAA (Baseball Stuffies Writers’ Association of America) we’ve taken the time to breakdown Stuffy Awards into Starting and Relieving categories. There won’t be any funny business where we pit a 60-inning reliever against a 200-inning starter. In the trend of having awards shows with great hosts; the Billy Crystals, and Neil Patrick Harrises of the world, the Stuffies would like to welcome Nick Dika to provide his insight into the MLB’s most (and least) Stuffiest performances. We’ll also present the “Not-so-Stuffies” for the pitcher who, despite lacking in the Stuff department, still managed to churn out innings on the season. To have the best Stuff – it isn’t about catching lightning in a bottle. You can’t just show up one day, throw the lights out, and claim you had the best Stuff in the MLB. That’s just not how the world works! To be eligible for the Stuff awards, I wanted those in the top 25% of innings pitched on the season, for both starting pitchers and relievers. This meant pitching 156 innings for Starting pitchers, and 46.1 innings for relievers. For rookies, those numbers were 63 innings for starters, and 24 innings for relievers. The Stuff metric is unfair to knuckleball pitchers, so they were removed from the analysis. To calculate the best Stuff on starting staffs and bullpens, the innings weighted stuff was calculated. Each pitcher’s stuff was normalized to their total contribution to innings for their team, then added together to get one Stuff value for each rotation and bullpen. This produced our Stuff champions. And without further adieu, let’s begin… the 2016 Stuffies! The big E as they call him down in Miami, put up great numbers in his rookie season. His sub 3 ERA matched up well with his 97mph fastball. Perhaps Jeffrey Loria will build a nasty stuff statue in centerfield at Marlins park to honour this historic performance? Despite his awesome stuff, Easy E struggled with his command at times. With the Silver Stuffy, we have Matt Bush. Matt Bush is featured prominently in the Stuffy awards – and if you watched Game 3 of the ALDS, you already know why. He has nasty, nasty Stuff. His fastball can get up into triple digits, and he separates his pitched by nearly 18″. That’s a lot of ground to cover at a high speed. While it’s a bit later in his career than we may have predicted, Dylan Bundy takes home a bronze Stuffy for Rookie Starter. Bundy’s combination of electric stuff and pitching for the Orioles means that he will almost undoubtedly turn into an ace when he is traded to a different team for spare parts at some point in the future. That or he will sit unused in the Bullpen while division rivals deposit baseballs in the outfield bleachers, eliminating them from the playoffs. Kenta Maeda has the lowest velocity of anyone on the Stuff lists, but he has elite separation between his pitches, and his change in velocity is close to the top of all of the MLB. This is a pretty impressive rookie performance for a command type pitcher. Finally, Jon Gray takes home the Gold Medal for Rookies! Grey had an elite fastball, and paired that with elite change in speed, and above average pitch separation. He had a great season for the Rockies – which amounts to a super amazing awesome season for a pitcher anywhere else. His beard is already elite, but now he’s the Stuff rookie of the year. Congrats, Jon Gray! So, a huge congratulations go out to Jon Gray and Mauricio Cabrera. You both had great rookie seasons, and showed the MLB what your Stuff was made of. Next season, maybe your team might give you a hand and you can win some games. When the Stuffies return – let’s look at what starting rotations and bullpens had the best Stuff of the season! Stay tuned for musical performances from the Thrill of Agony, and the Wet Wingsmen. A lot has been made about Aaron Sanchez’s workload this season. He’s entering uncharted waters for innings pitched, throws incredibly hard, and is insanely awesome. Little has been made about the workload Marcus Stroman has endured this season – where he just crossed the 200 inning threshold. Remember when he and Sanchez were yelling about 200 innings in the off season? It’s awesome to see their hard work rewarded this season. Given the ACL injury Stroman sustained last season, a lot of his workload occurred behind the scenes under the watchful eye of Blue Jays’ physiotherapist Nikki Huffman (at the time, from Duke University). He only pitched 27 regular season innings in 2015 with the big league team. Despite the baseball reference page saying he had a limited workload for innings, he was without a doubt, using his arm. When Stroman first came up in 2014, he was used as a reliever, before getting his chance to start. This once again, limited his innings. 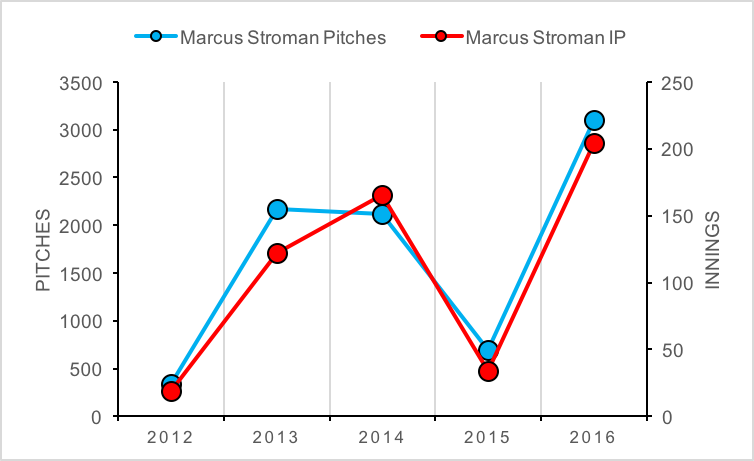 I wanted to use Fatigue Units to examine changes in Marcus Stroman’s workload over the course of his professional career, and see if 2016 was a giant spike that could lead to future injury. First of all, I had to take a few liberties with the data set. For minor league data, there are no values for pace, starting vs. relief innings, or total pitches. So, I had to make some changes. I once again used a linear regression approach, and tried to find out predictors for pitch counts in a season – using MLB data. I included games, games started, innings pitched, BB/9, and K/9 as input variables – all which ended up being significant predictors. Overall, this model produced an R2 of 0.98, with a standard error of 131 pitches. It isn’t perfect, but it will do for this application. So, we’re now one step closer to calculating FUs. 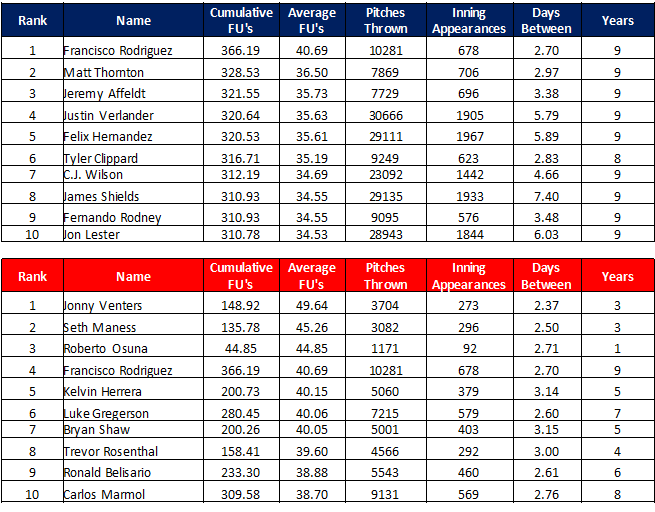 For the remaining information, I used the average fastball velocity from the MLB data, and the pace from the MLB data. I assumed there was greater care given to the type of pitching appearances (for example, how Sanchez’s MiLB starts were short in duration, but still 5 days apart). I made the assumption that all innings were starter innings, and used these for the calculation of MiLB FU’s. As a reminder, I am using “Predicted FU’s” from FanGraphs data – not the actual calculated FUs, so there can be an error of up to 3.5 FU’s. For a refresher – read up here. Without a doubt, 2016 is the highest traditional workload season that Stroman has seen. He has set career highs for pitches, and for innings. Compared to 2014 (his next highest season), 2016 represents a 23% increase in innings, and a 45% increase in the total number of pitches thrown. Now, looking at FU’s, the story is not nearly as daunting. 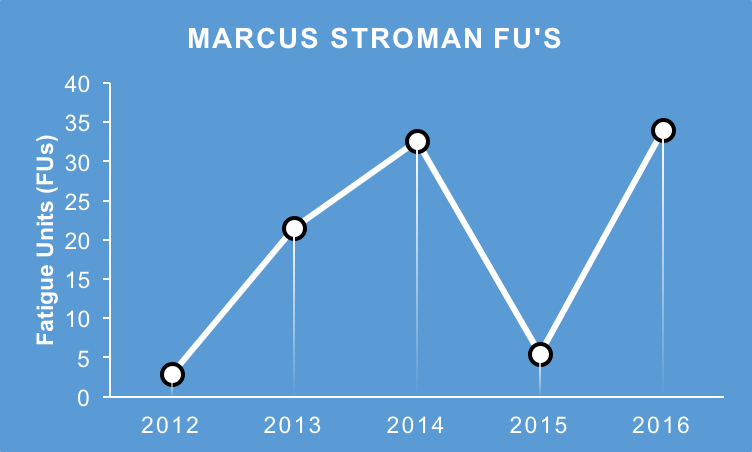 His highest workload season before 2016 saw Marcus accumulate and estimated 32.6 FUs, where as he sits at 33.9 FUs in 2016. This only represents a 4% increase in peak workload. This is because in 2014, Stroman pitched more innings out of the bullpen, and in 2016, he works solely as a starter. As I had previously written – typically, someone who throws out of the bullpen throws at a higher effort level than when they are a starter. This is the same for Stroman – 95mph when he worked in relief with the Jays in 2014, compared to 93.5 when he worked as a starter in the same year. Traditional workload metrics (innings pitched, and pitch counts) have long been researched, and the findings have all come back as being null – these metrics don’t help in injury prevention or prediction. Even less can be said about Fatigue Units – because there has been next to no research on this topic – other than what you have read on this website! That being said, this shows a very encouraging trend – that Stroman’s workload has been closely monitored by the Blue Jays staff, and he is not showing any signs of breaking down. I once HAD concerns about Stroman’s workload increase, but I am comfortable in saying that those concerns have been alleviated. I write a lot about Stuff on this site, with the goal of quantifying Stuff for the entire MLB. However, I am unabashedly, a Toronto Blue Jays fan first – and a Detroit Tigers fan (a distant) second. Part of the fun of using the PitchF/x data on the fangraphs site, is that I can look back in time, and figure out how different pitchers compare against each other. Also, if we’re looking to find out who had the best stuff in Blue Jays history – we can draw some inferences here. Fastball velocity has increased throughout league history, so it is reasonable to say that in the past 10 years, we have likely seen the best stuff in MLB pitcher history. Let’s look at the Jays all time stuff leaderboard. I’ve been writing stuff reports on the Jays pitchers over at Baseball Prospectus this season, so the top of this list shouldn’t be too shocking. Aaron Sanchez may have the best Stuff in the history of the Blue Jays. My favourite arm in the top 10 has to be Brandon League – I loved watching him pitch for the Jays, despite his short comings (giving up bombs at inopportune times). I was a bit surprised to see Ricky Romero up as high he was – as I always viewed him as a command type pitcher. In reality, his pitch separation was elite, and he had decent change in speed. It’s a shame his knees gave up on him. Once again, Aaron Sanchez tops the list – but Joe Biagini comes in second, with his rookie season being the second best stuff season we`ve seen in the past 10 years for the Blue Jays. The biggest surprise I`m seeing is down near the bottom of the list. BJ Ryan sits in the negative with his stuff – and all I remember is him coming out of the bullpen and annihilating hitters with his fastball. Maybe it was the fact they put up flames on the video boards, more so than he was throwing flames?? I’ve been tricked again! 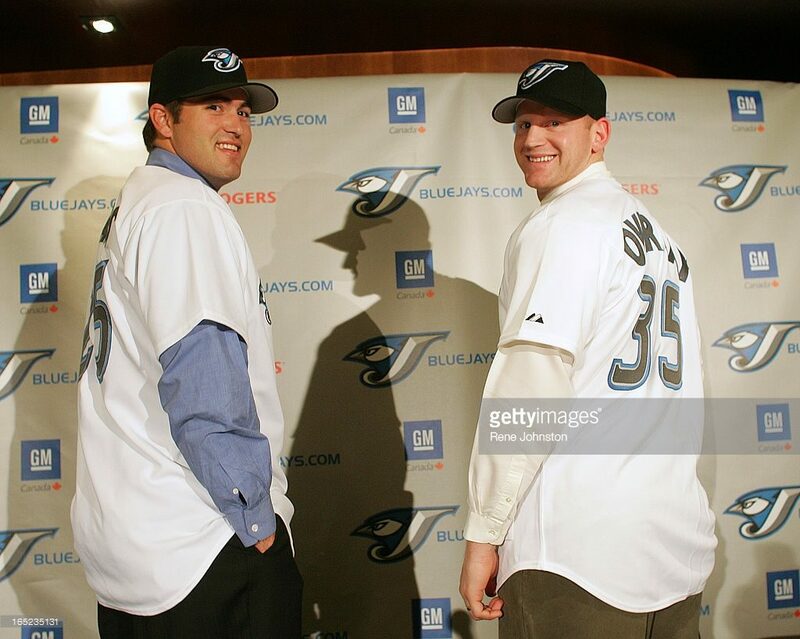 Well, now that we know what Brandon Morrow’s stuff looked like with the Jays in 2010, let’s move on to understanding pitcher workloads since 2007. First – a foray back into my thought process for the days of rest penalty in the metric. If you look back to the second article on Cumulative FU’s, I proposed that for consecutive day appearances, the FU’s be multiplied by 5. For 2 to 4 days of rest, the FU’s were multiplied by 2. For the standard, every 5th day – there was no multiplier for the FUs. When I looked at the predicted FU’s for all pitchers (and as you’ll see shortly), the high use relievers – 80-100 innings in a season – had the highest workloads – significantly higher workloads than starters for the most part. I thought, I may have to make an adjustment to the metric – but I wanted to look at starter vs. reliever injury rates first. I downloaded Jon Roegele’s Tommy John Surgery (TJS) list (@MLBPlayerAnalys), and then classified pitchers as relievers (if 80% of more of their innings came from relief innings), or starters. I compared numbers from the 2007 to 2016 seasons. Only pitchers who pitched 10 innings in a season were included in the analysis. I looked at the sum of innings pitched and the number of TJS that occurred for all pitchers, and came up with a ratio of innings per TJS, for both starters, and relievers. There were a total of 125092 innings pitched by Relievers during this time period, and 290401.1 innings pitched by starters. During that time, 151 relief pitchers required TJS, and 141 starters required surgery. This worked out to a ratio of 848.4 innings per TJS for Relievers, and 2059.6 innings per TJS. These data should likely be vetted a bit more carefully before they’re viewed as gospel – but this is a scary number. Aren’t reducing innings and pitches during the season supposed to protect relief pitchers’ arms? I have argued that pitchers often throw harder when they move to the bullpen, and that this extra velocity places more stress on the UCL. In that same time period (2007, to 2016), relief pitchers threw their average fastball at a velocity of 91.5 +/- 3.35 mph, and starters threw their fastball at an average speed of 90.7 +/- 2.6 mph. Maybe, just maybe – those back to back to back appearances that relievers can make are worse for their bodies than the 6 innings pitched every 5 days? Anyway – let’s move on to the workload metrics since 2007! The 2011 Rays take the cake for total workload for starting pitchers. Lead by David Price and Big Game James Shields, the Rays starters were not only good – they worked hard in the 2011 season. Overall, the highest average workload belonged to the tigers – particularly in 2014 and 2015 seasons. The highest workload for a starting pitcher belongs to Justin Verlander in 2011. In fact, it is alarming to see just how many times Verlander and Sabathia’s names show up in the top 25 of this list. Those guys were horses in their prime – and it’s unknown how those huge workloads contributed to both of their recent injury problems. Conversely – how much of their durability during that time was because they worked so much, and had great pitching fitness? The Rockies 2012 bullpen put in the most about of work during the past ten years. This was a direct result of a really bad starting rotation – only one pitcher cleared 100 innings pitched. The relief core was totally hung out to dry on this team. Overall, the Nationals had the highest yearly workload average for their bullpen (though this is driven by the late 2000’s when they were not very good). There is a general trend for bullpen workloads to increase in the past 10 years – with 2015 having the highest workload for relievers in that time frame. At first glance, I have to say – these numbers looked just… wrong. Then, I looked again – and they didn’t change. Francisco Rodriguez put up an INSANE workload in 2010 – 62.84 – with nearly 1800 pitches, and over 100 innings. That’s a lot of exposure to high pressure situations, back to back days, and pitches per inning. The set up men, and the swing men – those who pitch more than an inning in relief, appear to have the highest workload levels. Something else that came up this weekend – was the topic of Dellin Bettances. After giving up a walk off in his third day of work in three days, people talked about his over use with the Yankees. In the past 3 years – no one has a higher workload than Bettances. You are welcome to question the FU’s! Hit me up at michaelsonne@gmail.com, or on Twitter @DrMikeSonne if you want to debate these findings! Every now and then, technological discoveries result in major breakthroughs in science. Certain things that come to mind are: the invention of the microscope and the discovery of insulin. While not in the same breath, the ability for me to split fangraphs queries by team, and by year, may go down as the biggest breakthrough that I have made. You were probably sitting around, kicking your TV and swearing at your friends while watching the Jays game today – so don’t you want to think about the happier times? Like 2006? Let’s take a look at what pitchers, and what pitching staffs have had the best stuff since 2007. Also, let’s look into what starting rotations and bullpens had the highest workloads in the last ten years. Ok, to truly qualify for these calculations, pitchers were required to appear in at least 5 games during the MLB season. To be considered a “true starter”, 80% of the innings a pitcher threw had to be in the starting rotation, and they could not have more than 9 relief innings in a season. To be considered a “true reliever”, 80% of the total innings had to be as a reliever, and the pitcher could not have more than 3 starts on the season. Are these rules unfair? LIFE IS UNFAIR. The best stuff of any starting staff belongs to the 2011 Royals. A fearsome staff that managed to have only one pitcher with better than a 0.500 record, this staff was built on radar guns, and probably not on pitching ability. Luke Hochevar had the best stuff on this staff – and would eventually find a home in the bullpen. In the time period studied (2007 – 2016), the best average Stuff belonged to the Royals (an average stuff value of 0.84), followed by the Brewers, then the Cardinals. The best individual stuff performance belongs to mine and Eno Sarris’s adopted son, Chris Bassitt. In 2016, Bassitt was putting up historic numbers before he sustained an elbow injury and had to have Tommy John Surgery. After that – it becomes the Jake Arrieta show. Before he put things together in 2015, Arrieta has exceptional stuff in 2014, as well as 2013. Sneaking into the top of that list is 2007 Rookie Ubaldo Jiminez. Something really interesting to note – it has been well documented that fastball velocity keeps getting higher every year – and Tommy John Surgeries are also increasing. If you look at Stuff over these 10 years, the Stuff in 2016 is the highest it has ever been. There’s been a relatively linear increase in Stuff over the years, as you can see in this graph. The Mariners 2013 bullpen had the best stuff in the past 10 years, lead by monster of Stuff, Tom Wilhelmsen (2.03). During the last decade, the best bullpen belonged to Tigers, followed by the Mariners and White Sox. 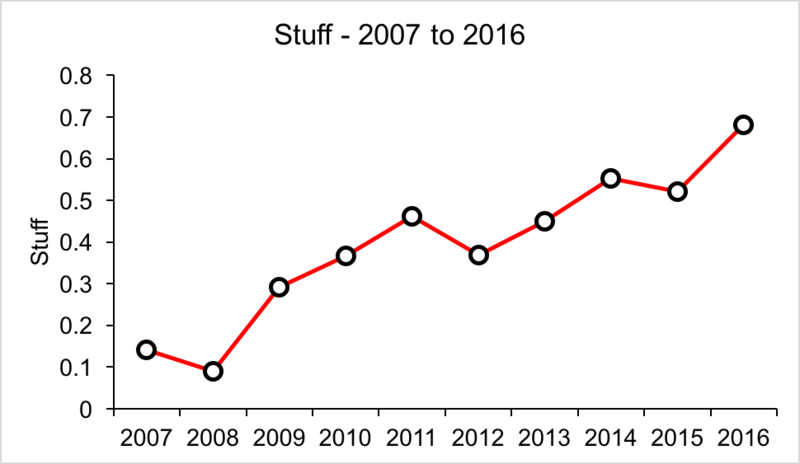 Similar to the Stuff report for Starters, Stuff has increased over that time period for reliever as well (0.29 in 2007, and 0.52 in 2016). We’ve seen some historic Stuff this season by resident piece of trash Arolids Chapman. In second and third place, a player near and dear to my heart – Joel Zumaya. I for one, fancied myself an experienced Guitar Hero player – so I can relate to the plight of Zumaya who hurt himself playing the iconic video game. If you need access to these data because you’re curious about more – let me know! I’d be happy to share it with anyone. If you think the metric is wrong – well, go jump off a bridge and make your own Stuff metric. It has come to my attention that, while updating the Blue Jays Stuff report over at BP Toronto, I have neglected the MLB stuff report on this site. No time like the night before Pitch Talks to fill everyone in on who has the best stuff in the MLB! The man remains entrenched at the top of his loft perch – Jake Arrieta has the best stuff of all starting pitchers in Major League Baseball. In fact, the top three are quite significantly higher than anyone else – Arrieta, Syndergaard, and Strasburg are the only starters who have flirted with the mythical 2.0 mark on the Stuff report all season long. For Jays fans, I would like to present how Syndergaard sits near the top of this list, and down at #108… well, you can guess who. The top starting staffs all reside in Chicago, with the Cubs at #1, and the White Sox at #2. 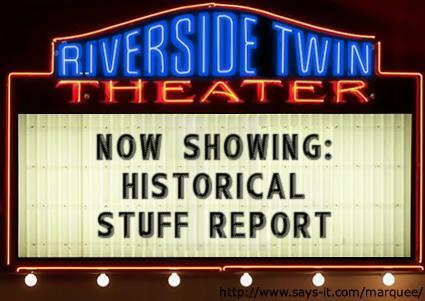 This goes to show – stuff isn’t everything. The cubs are closing in on a 100 win season and the White Sox… well, they’re fighting to steer clear of the Twins at the bottom of the central. Chapman still sits at number 1, but Mauricio Cabrera seems hellbent on taking the reliever Stuff crown. Both of these arms have an average fastball velocity of over 100mph. That’s their AVERAGE fastball. To make it worse? They can both drop it down into the 80’s when they need to. As for Bullpens, the Red Sox – buoyed by the electric arm of Craig Kimbrel – have risen to the top of the Stuff rankings. The Cubs are close behind, and the Jays lurk in fourth. Are you coming to Pitch Talks? Do you have your tickets? If you order your tickets online, use the promo code “stuff” to get $5 off your ticket. See you there! To calculate individual game FU’s, you’ll have to download the pitchFx database. However, if you want to get an idea of how much fatigue a pitcher has accumulated during a season, there is an easier way. Overall, the R2 value was 0.95, and the RMS error was 3.0 Cumulative FU’s. Not too bad. Looking a bit more specifically, relief innings pitched was the most significant individual predictor, at R2 = 0.43. 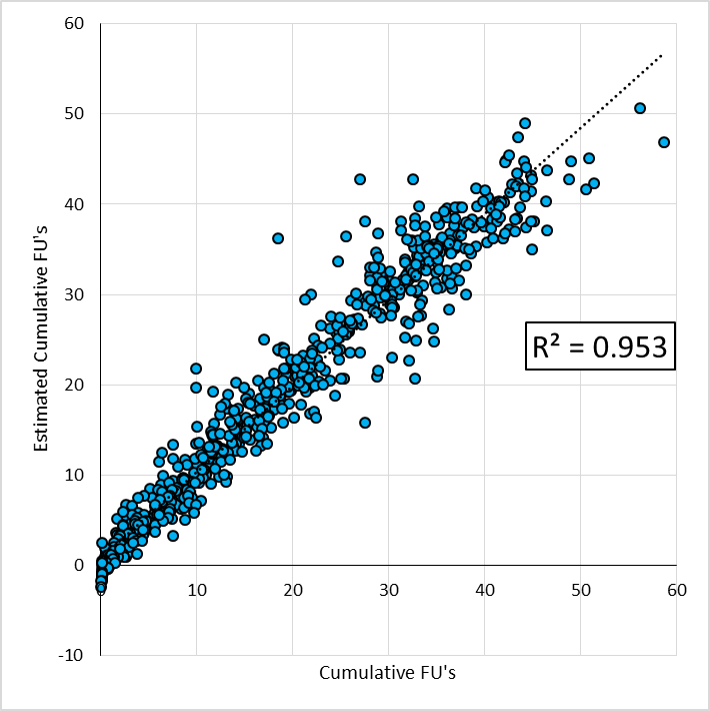 The combined variables produce the most accurate replication of the Cumulative FU metric. If you want to use this to estimate workload in pitchers, the formula is: Cumulative FU’s =-3.38 + 0.10 * IP + 0.43 * Relief IP + 0.12 * Pace + 0.004 * Pitches. With all of this in mind – now, let’s take a look at some 2016 data. I went on the FanGraphs site, and generated a custom report with IP, Pitches, Relief IP, and Pace included. Once again, the list ends up being fairly reliever heavy. Erasmo Ramirez has the highest workload so far this season, with at total of 44.38 FU’s. The first starter that appears on the list is Christopher Devenski at number 2 – but he has started 25 out of his 93.1 innings have come as a starter. The first dedicated starter on this list is Trevor Bauer, all the way down at 62. 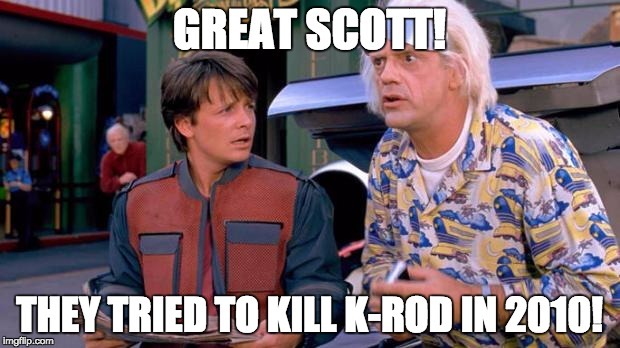 Once again, he has pitched out of the bullpen at times this season. With only starting innings showing up, Justin Verlander is at 72, accumulating 32.3 FU’s on the season. Catering to my Blue Jays friends, Roberto Osuna leads the team in FU’s, accumulating 34.5 on the season. He’s followed by Joe Biagini, with 33.6. Aaron Sanchez is at 26.7 on the season – which looks like it will be less than his 34.6 FU’s he accumulated during the 2015 season. 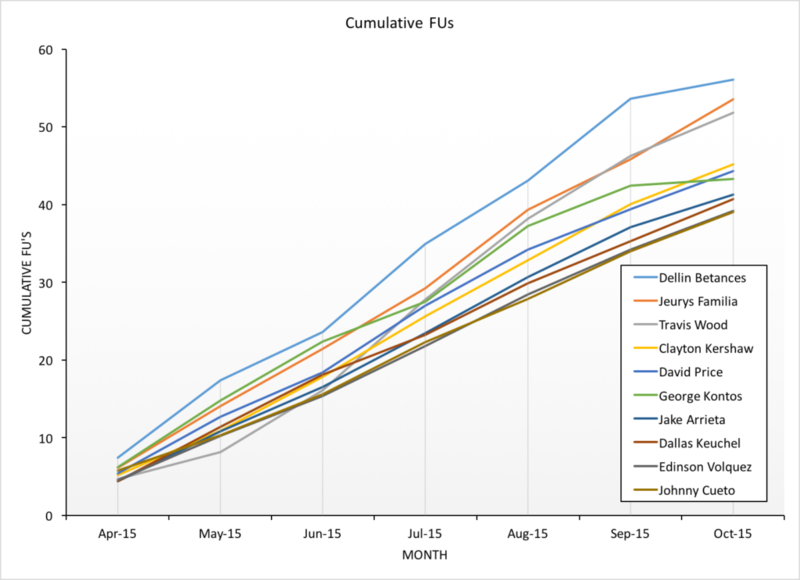 Here are the Blue Jays cumulative FUs for the 2015, and 2016 seasons, respectively. As with any metrics, tinkering will happen over time. 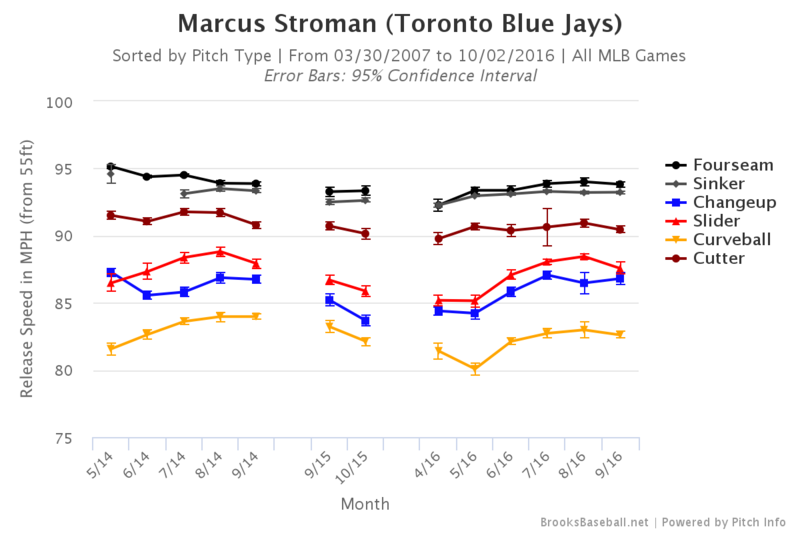 Interesting to note between the 2015 season – while Sanchez has had a reduction in workload, look at the increase seen by Marcus Stroman. He made his miraculous return in September last year, only accumulating 7.53 FU’s in 2015. This year, he’s at 27.33 FUs. Read Part 1 to see how FUs are calculated for pitchers during their appearances. As we have learned in many different ways that are not a lot of fun, both relief pitchers and starting pitchers can succumb to the effects of pitching. This makes the Pitcher Abuse Point scale not appropriate for relief pitchers (see this article on Baseball Prospectus – (Jazayerli, 1998)). Other research has pointed to measures like innings pitched as being a poor determinant of workload in pitchers (Karakolis paper). Pitching on consecutive days, high velocities, and total pitches have been identified as risk factors for injury – let’s try and combine them all into one metric. Starting with the FUs I described in part 1, I took a shot at modelling fatigue in every game in the 2015 MLB season. I downloaded the PitchFX database, and extracted the number of pitches, batters faced, innings pitched, and total time for each inning, for every game. I broke this down by pitcher, game, and inning, and was left with an FU for each inning during each game. To get a cumulative FU for each game, I just added these inning FUs up for each pitcher. Velocity has also been indicated as a risk factor for injury, and the source of greater UCL stress (Whiteside et al., (2016), Sonne (2016)). To add in the effect of high velocity, a scaling factor was created using the average velocity of 92.16 mph. The peak velocity during each appearance was scaled to this, creating a factor that ranged between 0.614, and 1.124. This value was multiplied by the FU in each inning to create a velocity scaled FU. Whiteside et al., (2016) showed reduced time between appearances was a significant predictor of UCL injury. Furthermore, the paper on heart rate variability in pitchers illustrated there weas less HRV the day after an appearance – which returned to baseline after 4 days. To include this in the cumulative FU, if a pitcher appeared in 2 games, back to back, they had a multiplier of 5. If their last appearance was between 2 and 4 days ago, they had a multiplier of 3. If their last appearance was 5 days or greater, the multiplier was 1. 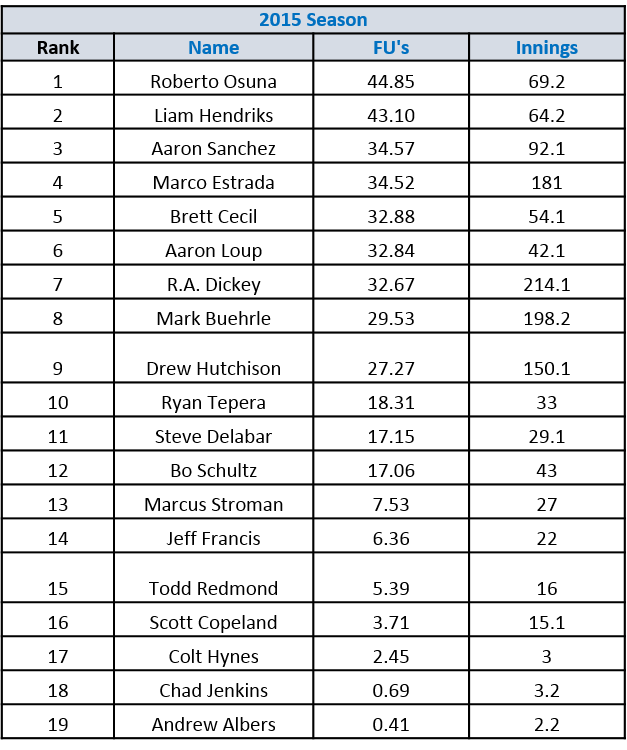 The velocity scaled FU was then multiplied by the rest multiplier, giving a cumulative FU for each game. These game cumulative FUs were then all added together, giving a season FU for each pitcher. I’ve included an example of one pitcher from the 2015 season that I feel shows a good example of how this metric can be used (and how I feel moving a pitcher from the starting rotation to the bullpen doesn’t necessarily help their arm). Aaron Sanchez started the 2015 season as a starter for the Blue Jays, but injuries forced him to the disabled list after his June 6th start. When he returned on July 25th, Sanchez pitched out of the bullpen. To relate this back to the Whiteside article, which indicated higher velocities and fewer days’ rest were significant predictors of injury, Aaron averaged a peak fastball velocity of 95.5 mph as a starter in 2015, and 97.3 mph as a reliever. The average time between appearances was 5.5 days as a starter, but 2.4 days as a reliever. I’ve compared his numbers against those of David Price – a known workhorse who remained in the starting rotation for multiple teams all year long. Figure 1. 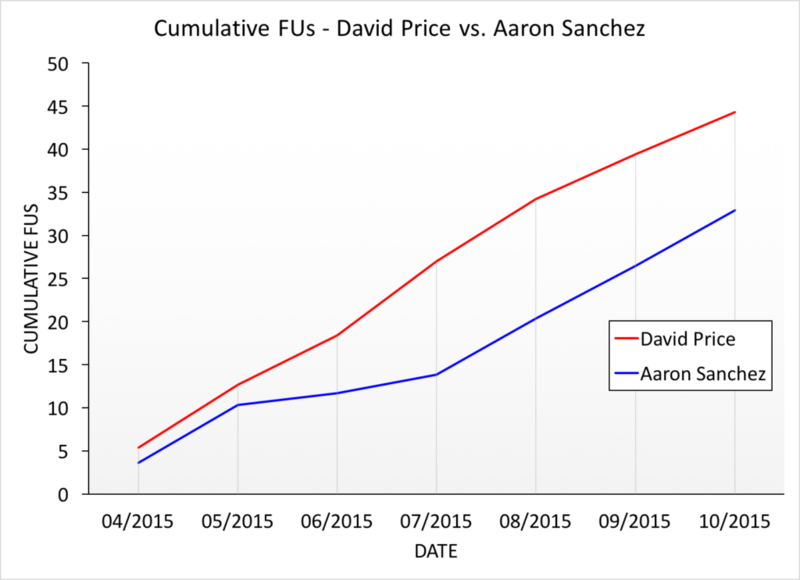 Aaron Sanchez and David Price’s cumulative FU workloads during the 2015 season. Despite Sanchez being moved to the bullpen, you can see that his cumulative FU’s still increase over the course of the season. Sanchez missed nearly two months in the 2015 season – and this can be seen in the plateau between May and July. When he returns from the bullpen, his workload begins to increase again, and matches the increasing trajectory of FUs generated by Price. Given the research reported by Whiteside et al., (2016), and inferred from the Motus data collected at Driveline – I do not believe that Bullpen work should be viewed as a “break” from the starting rotation. There are unique demands associated with this type of pitching, and the workloads that the pitchers are subjected to when pitching in relief are not accurately captured by traditional metrics such as pitches thrown, or innings pitched. Let’s take a look at how Cumulative FU’s can capture the workloads of all major league pitchers from the 2015 season, and compare them back to the traditional metrics. First, I wanted to see if the Cumulative FU was just a surrogate for IPs or pitches thrown – if it was, there is no point in using this metric! To do this, a Pearson correlation was used, and the R2 was calculated. Just as a note – this is not “innings pitched”, it represents “innings appeared in”. My thought process was – if a pitcher is coming out for an appearance, they perform the same warm up pitches, and bullpen work, regardless of how many outs they record. If a pitcher throws 30 pitches, while getting shellacked and does not record an out – this should still count towards the cumulative innings total on the season. Cumulative FU’s were significantly correlated with other workload metrics, but not enough to believe they’re just a replication. After all, if you throw a lot of innings, that does represent a higher workload… it just may not capture the whole story. Looking at IP and total pitches, these measures explained 36.5% and 29.5% of the variance in cumulative FU’s, respectively. The number of outings in a season explained 65.2 % of the variance in cumulative FU’s, and the average number of days between appearances explained 27.9% of the variance in cumulative FU’s. I examined the top workload pitchers for each of these metrics as well. I broke these metrics down by month of the season, so the cumulative workloads could be analyzed over time. Figure 2. Cumulative Pitches Thrown during the 2015 season – top 10 pitchers. Figure 3. 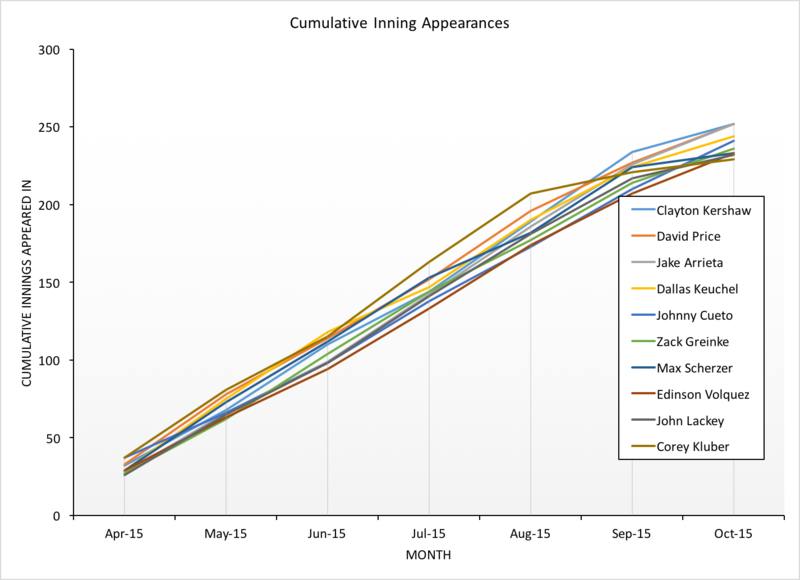 Cumulative Inning Appearances in the 2015 season, broken down by month. Figure 4. 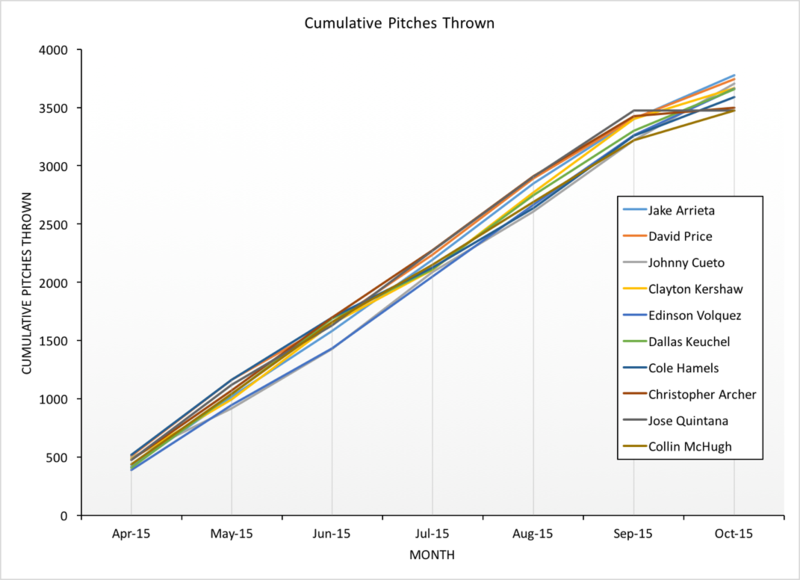 Cumulative FU’s for the 2015 season – top 10 pitcher workloads. Once again, I don’t think it would surprise anyone to see Clayton Kershaw at the top of the innings pitched workload metric, or Jake Arrieta as the pitcher with the most total pitches thrown. These are both work horses for their respective teams. However, in both innings pitched, and total pitches, you will noticed that there are no relief pitchers. Looking at cumulative FUs (Figure 4), Dellin Betances – he of 76 total game appearances, and Jeurys Familia (appearing in over 80 games for the Mets) appear at the top of the list. This is followed by Travis Wood (who appeared as both a reliever and a starter for the cubs), and finally, by Clayton Kershaw. Starters Price, Arrieta, Keuchel, Volquez and Cueto round out the list. This workload metric appears to show more favour for relievers, who appear on short rest schedules, often throw harder, appear in more games than starting pitchers. Let’s look one step further, and see who has the highest workloads between the 2007 and 2015 seasons. First of all – who cumulatively had the highest workload during this time, and second – who had the highest average workloads during this time period. Table 1. Top 10 for cumulative FU’s between 2007 and 2015 (in blue). Top 10 for average cumulative FU’s in a season between 2007 and 2015 (in red). Francisco Rodriguez has kind of run away with the cumulative FU crown – accumulating 366.19 FUs over the past 9 seasons. Serving as a closer – and surely, an elite closer, K-Rod has consistently averaged less than 3 days between appearances (on average, 2.7 days between appearances). Jonny Venters has the highest average season FU, at 49.64. His average days between appearances during those years with the Braves was 2.37. This is concerning, given his flame out of the major leagues due to injuries. Depending on how you think about workload, these lists may surprise you. The overall cumulative workloads have half relievers, and half starters. The highest yearly averages all belong to relief pitchers, without a single starter in this list. Even more concerning about the top seasonal workloads is the injury history of these pitchers – Venters and Manness needed Tommy John surgery after huge workload seasons, Trevor Rosenthal is down with a shoulder injury currently, and Belisaro flamed out of major league action. Carlos Marmol eventually lost all of his ability to throw strikes and is no longer on a major league roster. Even Francisco Rodriguez – who has remained relatively injury free (aside from a back injury) – is now throwing his fastball 5mph slower than he did in 2007. This is a legitimate concern for the number 3 pitcher on this list, the Blue Jays Roberto Osuna. As a teenager, Osuna had one Tommy John surgery – which is a risk factor for subsequent UCL reconstructions. Bear in mind – this list, and assessing workload with injuries, is completely anecdotal at this point. Much greater analysis is required to see if this workload metric is an indicator of injury potential. From a pool of 1869 pitchers, over the span of 9 seasons, this is the range we are seeing for cumulative FU’s. 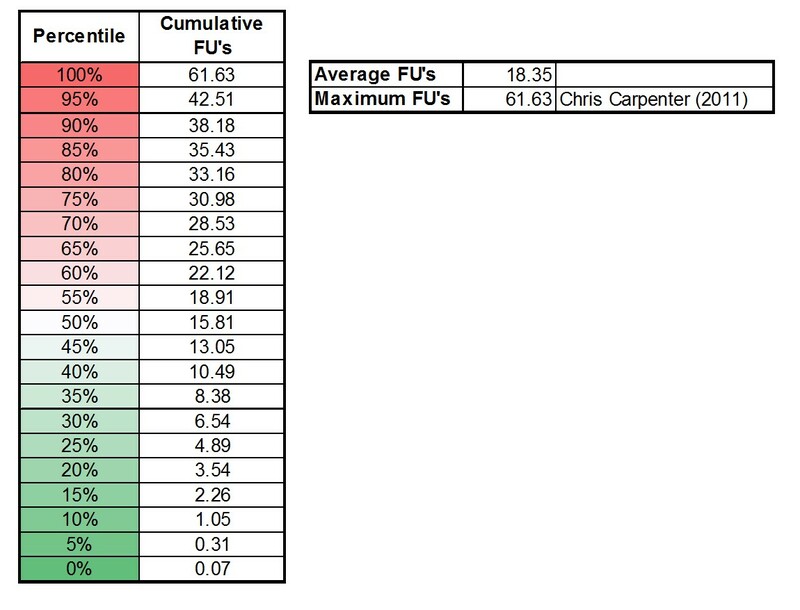 The average FU in a season is 18.35, and the maximum is 61.63 – from the 2011 season, which proved to be Chris Carpenter’s final season as a full time, major league pitcher. If someone gets to a level of 40, you can consider that a very high workload season. Like all metrics, there is a long way to go for us to understand what exactly all of these numbers mean. If you have any feedback, or questions about this method – shoot me an email (michaelsonne@gmail.com), or send me a tweet @DrMikeSonne. If you’re curious, here are the data for different workload metrics. Karakolis, T., Bhan, S., & Crotin, R. L. (2015). Injuries to young professional baseball pitchers cannot be prevented solely by restricting number of innings pitched. J Sports Med Phys Fitness. Whiteside, D., Martini, D. N., Lepley, A. S., Zernicke, R. F., & Goulet, G. C. (2016). Predictors of Ulnar Collateral Ligament Reconstruction in Major League Baseball Pitchers. The American journal of sports medicine, 0363546516643812. Sonne, M. (2016). Pitching Velocity and its Effect on UCLE stress using the Motus Sleeve. Driveline Baseball Blog, posted July 27, 2016.